According to The Atlantic, the Immigration and Customs Enforcement (ICE) has arrested more than 41,300 undocumented immigrants during the first 100 days of Trump's presidency, representing a nearly 40% increase, compared to the same period during 2016. The report, issued by the ICE on Wednesday, said the data "reflects President Trump's commitment to enforcing our immigration laws fairly and across the border," in the words of Office Director Thomas Homan. Almost 75 percent of those arrests are convicted felons, according to the report, with charges ranging from homicide to drug trafficking, representing a 20 percent increase in arrests since 2016, as The Atlantic continues. "But only 2,700 of these convictions represent violent crimes ... when the arrests of undocumented immigrants, whose only crime has been to live illegally in the United States, has increased by a much larger margin." 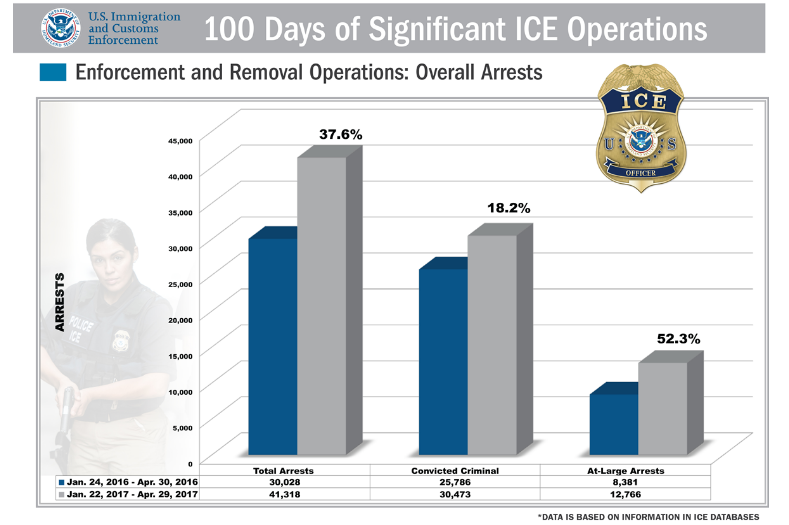 According to the ICE analysis, between January 22 and April 29, around 10,800 "non-criminal arrests" would have been carried out, compared to the 4,200 carried out during the same period during 2016. But what the report does not show in factual data is the rate of deportations or particular cases of illegal citizens removed from the country. This raises the national debate between immigration measures aimed at removing foreign citizens who are involved in criminal acts and arbitrary arrests based on racial prejudice that affect much of the Latino community in the United States. According to Homan, the Office "will continue to look for all undocumented immigrants who have received a final removal order from an immigration judge, including those who do not have a criminal record." For the Director of ICE, "All those who enter the country illegally would be violating the law. That's a criminal act, " as reported by USA Today.